This is a POP meter, which means it used "printing out paper" to measure light intensity. Printing-out paper (as opposed to developing-out paper) turns dark directly under sunlight, without the use of chemicals. It was commonly used at the turn of the 20th century. You'd put the negative over a piece of paper, hold it up to bright light until the paper darkened, then process it with chemicals to stop further reactions and make the image permanent. It worked, but developing-out papers proved better. So now you know the seconds. You pick an ƒ/stop that you want to work at, let's say ƒ/16. You look up the film speed on a chart. Let's say I'm using Kodak Extra Rapid, which is rated at 180. I put my thumb on the dial glass and pinch it down snugly against the case back, and I hold the stem of the case stem with my other hand, and I rotate the case-back/dial-glass/POP until ƒ/16 matches up against 180 on the left side. Then I look on the meter's right side, and those are my ƒ/stop shutter combinations. For this example, I would use ƒ/16 at ½ second. One of the tricky things about this meter is learning to read the outer dial. It begins at the 5 o'clock position (in the photo here) in full seconds and gets shorter as we move counter-clockwise. Around noon we move into fractions of a second, so this thing tops out at 1/500th of a second shutter speed. According to the instructions, you can convert to minutes as well. There are two manuals that I know of on the internet. Mine is the 7th edition (click on the pdf icon above) and has data for American films and cameras (including Kodak's uncalibrated ƒ/stops). There's also this 12th edition from an excellent Weston meter site. Their edition is British and more recent than mine (apparently post World War I). There's also a little more info at the wonderful BoxCameras.com site. Roger Hicks has a 17th edition on his website. Two companies made these things and they're very much alike. Wynne made the Infallible, and Watkins made Bees in Hereford, England. Mine was imported by the famous outfitter Burke & James out of Chicago, so there's a bit of co-branding, plus mine is calibrated for US speeds and films rather than British. One of the neat things about this meter is that they could recalibrate it simply by printing a new face card. According to later literature, you could buy different cards depending on your needs (like a Studio version). 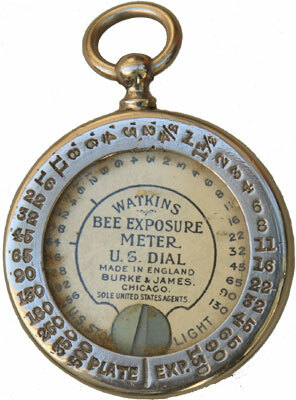 It appears tht Watkins named this the "Bee" because another of his interests was beekeeping. Figuring out the age of this has been tough, since they didn't date any of the literature (that I've found, anyway). They made these things for years; the original came out around the mid-1890s and wasn't fully obsolete until the 1930s when photo-electrics came out. And they continued to make and sell them long afterward because photo-electrics were expensive. Figure a Weston Master was $30 in 1940, which was the same price as a decent camera) and these things were $1.50 or so. For depression-era amateurs, a Bee was very affordable. That said, considering the cameras and films listed in my instruction book, I've dated mine to around 1907.